On September 7, Golden Year 7 (2010), Supreme Master Television’s 4th anniversary was commemorated with a vibrant concert replete with international flair. The concert, entitled “Gifting Peace,” was hosted by two highly accomplished vegans: four-time NBA basketball champion John Salley and CNN/CBS legal analyst Lisa Bloom. Featuring many esteemed participants, the concert took audience members on a memorable journey through the realms of poetry, music, and dance. In addition, Supreme Master Ching Hai set aside her precious time to grace the event via teleconference as Guest of Honor. Supreme Master Ching Hai fulfilled the longing of many audience members and agreed to a spontaneous question-and-answer session in which she shared her insights on love, peace, and forgiveness, and what they mean for us, our animal co-inhabitants, and our beautiful planet. 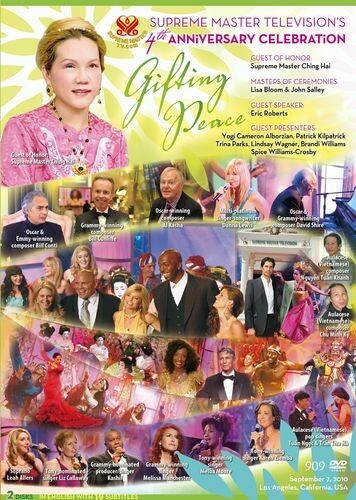 Then, for her great efforts in assisting humanity as a world-renowned humanitarian, artist, and spiritual teacher, Supreme Master Ching Hai was recognized with the Presidential Volunteer Service Award from US President His Excellency Barack Obama, presented by The Honorable Mike Davis, California State Assembly member.